– And let us know how it goes! – Post on your wall and tag #wrapunzelhusbandchallenge or share it on the fangroup! ← Some REALLY Awesome Tutorials! IGreat idea for Purim, too. And, this will give our husbands an idea why it sometimes takes a while to get ready. Love that your husband is enjoying this. The beard is a perfect accessory! your husband deserves a medal for trying, I laughed my way thru the video, my hubby has no interest in trying to tie a tichel. My video can’t be sent by Facebook or email for some reason! Too long maybe? It’s only 2 min. Please advise! We had fun. Good Sunday distraction. HA! Your SO is more adept than I am at tying! Good fun! I give you’re husband a lot of credit! My husband doesn’t watch wrap so would have no idea how to do it. He’s amazed by how my tichels turn out. I’m happy with that. I have never seen such a manly-looking tichel! The blue really sets off the red beard, true 😉 Thanks for posting this! Made me laugh. My husband was a great sport. I purposely used a blue scarf because that’s his favorite color. It worked. Am I the only person who feels a little uncomfortable about this? A Queen’s crown is for the Queen only. A King puts on his own crown, not the Queen’s. Would the Queen put on the King’s Tefillin and Tallit? Yael Sarah – I hear ya… but take a look at pictures of the Ben Ishai and other gedolim from that time – they all wore turbans! 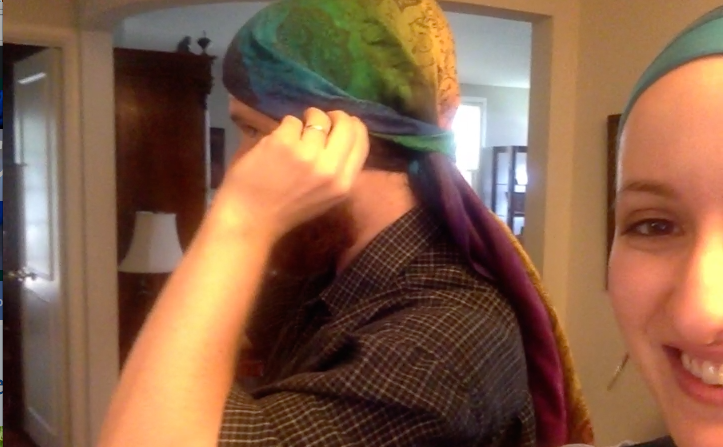 This is not like putting on Tefillin/Tallit – my husband (and many others that we’ve spoken to) would totally wear turbans if it was socially appropriate! I get that, and understand you, Andrea. I think turbans on men look good. However, a man wearing his wife’s headwrap doesn’t make sense when looking at Deuteronomy 22:5. Perhaps I am too frum to understand. We looked into it and it wasn’t a problem for us 🙂 A scarf is not ‘women’s clothing’ nor was he going out in public or pretending to be a woman. I can see why you would find it an issue but ask your LOR and you’ll get your answer. I’m sure everyone would hold differently but we were perfectly fine with it! Sorry for making you uncomfortable. Thank you very much for the suggestion to speak to my LOR! He was in agreement with my concerns, based on that the scarf belonged to a woman and had previously been worn by a woman. As you say, we all hold differently. I respect you very much and I thank you kindly for responding to my concerns.